It's been a long haul for Alaska's delegation in Washington, D.C., in trying to wake their colleagues up to the fact that the U.S. is operating at a shocking resource deficit in the Arctic. For years, Alaska's senators and Rep. Don Young have worked to convince the rest of Congress (and some parts of the Pentagon) that America's icebreaking capacity is woefully inadequate to the task of maintaining a leadership role in circumpolar affairs. That this deficit persists — even as the U.S. defense budget is higher than ever — shames our priorities as a nation. That a faction of Congress still actively opposes funding new icebreakers is an indictment of their judgment as elected leaders. 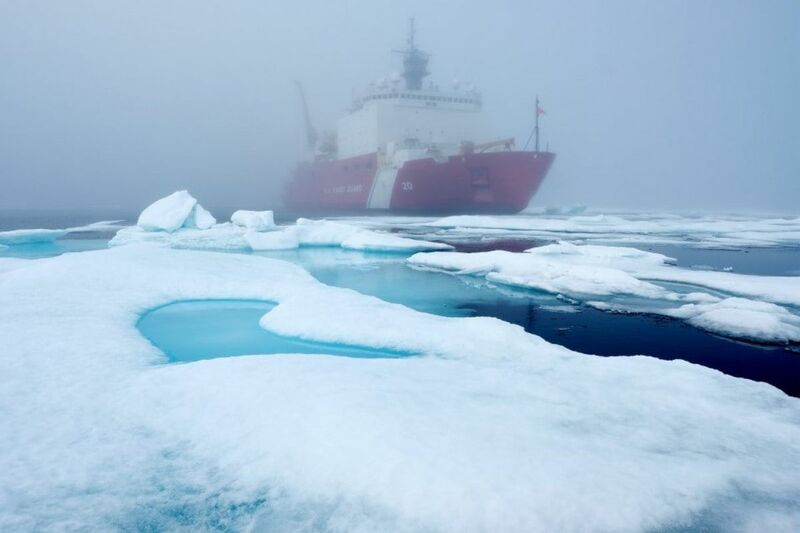 It isn't as though the federal budget has been held in check so well that no money could be found to help augment the two U.S. icebreaking vessels, the medium icebreaker Healy and the heavy icebreaker Polar Star. The last time the U.S. government operated at a surplus was in 2001. Since then, members of Congress on both sides of the aisle have been entirely willing to spend at annual deficits of hundreds of billions of dollars. In 2017, military spending tipped the scales at almost $600 billion. But when it comes to constructing replacements and expanding capacity for the minimal U.S. icebreaking fleet, many in Washington, D.C., suddenly can't find two nickels to rub together. So why are icebreakers important for the U.S.? In short, because our world is changing. Retreating sea ice is opening up potential for Arctic shipping lanes. The global balance of power is shifting toward Pacific nations such as Russia and China that have aspirations to assert their superiority in Arctic waters. Trade, tourism, fishing and other industries are pushing farther north than ever before. Transits by vessels through the Bering Strait have more than doubled during the past decade. And the U.S. can't even have a continuous presence along its own coastline without icebreakers. The Healy and the Polar Star have done great work for the U.S. Coast Guard, but the Polar Star in particular is on its last legs. More than 40 years after first coming into service, the only heavy icebreaker in the U.S. fleet has survived by virtue of extensive repairs that have required cannibalizing parts from its decommissioned sister vessel, the Polar Sea. The Healy is almost 20 years old, and has seen hard service in polar waters. In one notable recent mission that displays the vital importance of icebreaker capacity, the Healy shepherded a fuel barge to Nome in January 2012 after the community iced in earlier than expected and was faced with the prospect of running out of heating oil before the sea cleared in spring. Other countries with a stake in the development of the Arctic and its newly navigable waters aren't sitting on their hands. During the past decade, U.S. icebreaker capacity has declined by 33 percent, from three vessels to two. Meanwhile, Russia has expanded its icebreaker fleet tremendously, with more than 40 icebreaking vessels in service and almost a dozen more planned. Vladimir Putin has likened the potential for Arctic shipping to a new Suez Canal, and announced his intention to control those shipping lanes. Even Canada, which has a defense budget one-thirtieth the size of the U.S., has seven icebreakers and five more planned. And yet, after heavy lifting by Sen. Dan Sullivan in successfully including authorization for as many as six new icebreakers in this year's National Defense Authorization Act, factions remain in Congress that favor slogans over substance. While the NDAA was in conference committee before headed to President Donald Trump's desk for a signature, the House Appropriations Committee opted to strip funds for the first new U.S. icebreaker in two decades from its Homeland Security funding bill, opting to augment the allocation for walls on the border with Mexico. There is room for differences of opinion on the wisdom or necessity of border security improvements. What's not acceptable is beefing up the southern border of the U.S. while writing off our nation's role in the Arctic, when a comparatively modest investment could save America from irrelevance in the crucial geopolitics of the far north. It would be shortsighted at best to make a budget trade-off that sacrifices national security interests in the north to make a marginal difference in stemming illegal immigration from the south. Alaska's delegation in Washington, D.C., have done an admirable job in working to convince their colleagues of the value of icebreakers, but there is yet more work to be done to break through the obstinacy of those who see the vessels as a pet project for the state. The U.S. can accomplish much if it embraces its status as an Arctic nation. But it needs icebreakers to be able to unlock that potential — to keep ships safe, to aid in search and rescue operations, to assert U.S. territorial claims and grow Arctic tourism. It's past time for Congress to stop blocking needed funds and allow the U.S. to establish itself as a leader in the North. The views expressed here are those of the Anchorage Daily News, as expressed by its editorial board which welcomes a broad range of viewpoints. Current editorial board members are Ryan Binkley, Andy Pennington, Julia O'Malley, Tom Hewitt and Andrew Jensen. To submit a piece for consideration, email commentary@adn.com. Send submissions shorter than 200 words to letters@adn.com or click here to submit via any web browser.